In the frame of the project RE:akt! 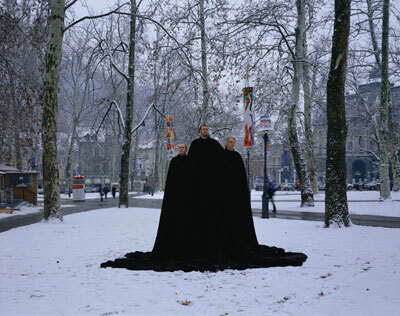 After 1968 a certain provocative controversy is at work in contemporary Slovene arts. 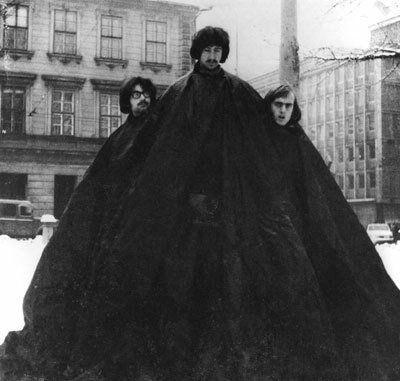 This experimental, retro-avant-garde and artivistic artistic-political controversy seemingly refers to the famed happening of the group OHO (Milenko Matanovic, David Nez, Drago Dellabernardina) Mount Triglav, which took place on 30 December 1968 in Ljubljana's Zvezda (Star) Park, and on the recyclings or reconstructions of that happening which were made first by the group Irwin (Andrej Savski, Borut Vogelnik, Roman Uranjek) Svoji k svojim/Gora Triglav (Like to Like/Mount Triglav) in 2004 in Zvezda Park, and later, by the artists Janez Janša, Janez Janša and Janez Janša - Triglav na Triglavu (Mount Triglav on Mount Triglav) on 6 August 2007 on Slovenia's Mount Triglav. 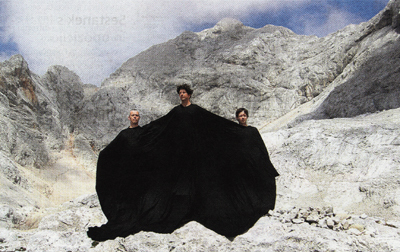 In the frame of an experimental artistic situation the three performances only seemingly metaphorize the geographic, national and state symbol of Slovenia: Mount Triglav. All of the works are the most radical executions of the politically sliding sign, that is, individual explanations of symptoms of Slovene identity and, more importantly, the historical construction and realization of political identities. Marx's well-known and without a doubt cynical dictum, which we've heard countless times and asserts that history occurs twice, first as a tragedy, second as a farce, misses or conceals a certain important point: that 'repetition of history' is never simply 'repetition', but is always an authentic event which has 'new' consequences. The occurrence of repetitions is carried out under different material conditions and in different circumstances. The carrying out of the 'same' or at least a 'similar' event in different measures and circumstances, produces different results. This point is necessary to consider when we observe, or rather, refer to or discuss the three 'Triglavs' in Slovene arts - the Mount Triglavs of 1968, 2004, and 2007 respectively. An organism is a functional and articulated relation of different organs. An individuum is an organism with an identifying 'social number' (personal ID number, tax number, social insurance number, voter registration number, resident registration number). A subject is the manifoldness of textual, audiovisual or behavioural manifestations which represent, show and describe a certain individuum and organism in culture and society. The OHO Group worked in Kranj and in Ljubljana between 1965 and 1971 on the field of Reism, Process Art and Conceptual Art. It was the first 'radical - urban - ideological' artistic appearance in Slovene modern arts. Its function wasn't only an experiment in the autonomous field of arts, but also the provocative gesture of neo-avant-garde artists in the sense of 1968 protests which stirred up the arrangement of arts, culture and society. From its inception, the OHO product, that is the 'article' and then the 'happening', was to carry out the concept of event as a visual metaphor which OHO members demonstrated in projects, such as Mount Triglav. The purpose of the 'visual metaphor' primarily boasts itself as a problem of the referential relation of visual appearances and the material or fictional world within them. The visual metaphor is a visual phenomenon which is erected in place of some other visual statement or discursive structure. OHO's concept of the object (article) or event (happening) was founded on the relation of object/happening and word. The work Mount Triglav, which was carried out as a happening, demonstrates the function of visual metaphor: three authors draped by a cloth from which their long-haired hippie heads looked out at three different heights. The title of the work (displayed in front of them) hinted towards Mount Triglav, that is, on the scheme: tri (three) + glave (heads) = tri glave (three heads). It established the following relational references. The position of the artists' bodies and cloth iconographically hints towards a mountain, that is, visualized was an iconographically oriented metaphor of a mountain. The Slovene mountain Triglav was metaphorically called such because of its three peaks which look like three human heads. The artistic work, which models a mountain, showed the relationship between 'mountain as material' and 'name as label'. Three real human hippie heads were similar to the three peaks of the mountain. The referential relationship between the title of the work Mount Triglav and the artistic work is repeatedly mimetic. This mimeticness has itself in social-realistic society political consequences, but shows that there are 'ideal' and 'universally established' symbols of work and socialist Slovene nation can also be established as an object of intervention of young rebels without a cause. The Irwin group was formed in the frame of the movement Neue Slowenische Kunst (NSK) in the beginning of the 1980s. The early Irwinistic mannerist and eclectic paintings illuminated iconographically national-socialistic arts, socialist-realism and avant-garde (above all Kazimir Malevich). They established a supervisory painting gesture in the traumatic fissure between the large totalitarian projects of the twentieth century and the crisis of modernism in the 1970s and 1980s. These paradoxical connections are weak points, symptoms of a political demonstration of reality - the ideological as phantasm. The works of the Irwin group are signs, with which the group destroys the symbolic power of the totalitarian discourse: the projection of reality. In regards to real and self-management socialism their activity still appears as an excess/symptom - graphic (painting) and declarative (manifesto) speech which provoke the existing system of political and artistic values, at which the trauma is pulled into a game as uninterpretive or hyperinterpretive. Retro-garde action is not avant-garde action because it uses the dead languages of arts and the dead languages of culture and politics (languages of avant-garde arts and the totalitarian system). With them are references to the archive of historically deleted or exploited traces, artistic, ethical and political excesses, traumas, symbols, expressions and performances; thus making their work anti-utopian. The series of works Like to Like: Irwin - OHO (2004) was made as the inverse of the status of retro-avant-garde artists. From the postmodern repudiation of avant-garde/neo-avant-garde Irwin group directed itself towards the establishment of its own 'modern or avant-garde traditions' in the frame of its national culture. Suprematism, nazi-art/culture and soc-realism were for the production of Irwin group dead signs of politics and arts. In contrast, the turn toward making images of OHO's anti-painterly and process protoconceptual events was an entirely different act - the act of appropriation which adopted some key artistic acts from the end of modernism, was executed in the traditional visual media and implemented as a culturally rooted fetish. A fetish is an 'object' of fascination. Triglav as an object of fascination is a fetish. On the other side, the visual or performative (2004) recycling or rather, photographic happening Mount Triglav wasn't only an act of self-historicization by the Irwin group. It also meant the grotesque provoking of one of the fundamental political suppositions of identifying politics in transitional, nationally homogeneous countries which were founded upon the disintegration of the second Yugoslavia. And signified the demands for national reconciliation: all that is Slovene - our - art and culture. Janez Janša (formerly known as Davide Grassi) was born in Italy in 1970. He graduated from the Academy of Fine Arts in Milan in 1994. Since 1995, he has been living in Ljubljana. His work is dedicated to the investigation of new media social contradictions and dilemmas. Janez Janša (formerly known as Emil Hrvatin) was born in Rijeka in 1964. He graduated from the University of Ljubljana's Faculty for Social Sciences and studied theatre directing in Ljubljana and the theory of theatre in Antwerp. His work is dedicated to the investigation of the role of conceptual strategies and tactics between theatre and society. Janez Janša (formerly known as Žiga Kariž) was born in Ljubljana in 1973. He graduated from the Academy of Fine Arts in Ljubljana. His work is dedicated to the investigation of new media and the roles of media productions of individual, cultural, artistic and social identity in the contemporary world. Davide Grassi, Emil Hrvatin and Žiga Kariž legally took the first name and last name of the current Prime Minister of the Republic of Slovenia, Janez Janša. The artists are not members of any artistic group or movement; rather they are individual authorial 'figures' who work in the interdisciplinary scene of Slovene contemporary arts. The 'work' that they realized, in short, is a reconstruction (reenactment, recycling) of the works of OHO and Irwin. At work is the repetition of the artistic events from times of the neo-avant-garde and the retro-avant-garde. This repetition actually becomes a grotesque of contemporary politics of Slovenia. But ... and this "but" is essential! OHO's event expressed a proclivity towards ludist grotesqueness -hippies in the place where we would expect a strong and righteous Slovene Worker/Farmer in the middle of the three-headed Mount Triglav. Irwin's 'cool' recyling flirted with postmodern cynical grotesqueness: retro-avant-gardists in the place of avant-gardists; consumer signs in the place of vital gestures; dandies in the place of hippies. Kariž, Grassi and Hrvatin's, that is, Janša, Janša and Janša's transparent positioning of the grotesque had within itself something tragic. Tragic is that the 'artistic work', as its constitutional element, has totally fixed and materially concrete societal, political and personal-subjective consequences for the life of an artist. Artists in contemporary times -such as Janša, Janša, and Janša -are no longer ludist actors (OHO) or professional creators of high art (Irwin), but 'subjects' in performative life praxis, which operates in the frame of transitional countries/state biopowers and their instrumental apparatuses. These types of artists carry out their 'individual selves' in the biopolitical mechanism, in which the 'machinery' has the effects of 'designing' or rather achieving the forms of its 'everyday/quotidian' and 'occasional' lives. We are dealing with 'artivism', that is, as it functions as art not from the 'basic arts' but from material moves or fluxes of the biopolitical society and its authority of biopowers. OHO and Irwin worked, or rather, intervened with the live performing in the frame of artistic autonomies, in the cultural and society space of socialistic and later, transitional Slovenia. Kariž, Grassi, and Hrvatin offered, in opposition, the 'live construction' of Mount Triglav on Mount Triglav as a sign of the predesign of their individual identities, but not as Kariž, Grassi, and Hrvatin, but more over for Janša, Janša, and Janša and for all concrete societal consequences of changing identities. And this is the point: the confrontation with the tragic in the work of the biopower, in the midst of repeating 'history', which, although calling tragically, resembles the grotesque. When someone today kisses the face, forehead or lips of Emil, Davide or Žiga, one will not touch Emil, Davide or Žiga, but Janez Janša. But then which Janez Janša? Who is Janez Janša? Who is here and now Janez Janša? There's no certain answer. Biopolitics are at work. Technology designs life. NOEMA is the world's first nomad art gallery. Specialized in digital art, it is based on Second Life and promotes varied, different-size actions, in physical reality. It proposes a pioneering experience, connected with the boldest concepts of contemporaneity. It is cybrid, because rather than suggesting a media hybridization, Noema proposes (and performs) experiences among on and off-line networks, in concrete and virtual spaces. It is cinematic, because it is located in an immersive and interactive environment that allows new image constellations. More than a hub of marketing and representation of artists and events, Noema is an innovative project, a creation plant that gathers from the start some of the major names in the digital art scene, such as Mark Amerika, Giselle Beiguelman, Lucas Bambozzi, Janez Jansa, Vera Bighetti, Gilbertto Prado and Rick Silva, among others.